Asymmetric character of the pattern. This input is the projection of the line segment between the start and the peak divided by the width of the pattern. The following illustration shows the definition of asymmetry. 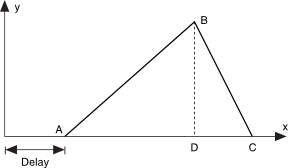 D is the projection of B on AC. Width of the pattern. This input must be greater than zero.